October courses begin officially on September 11, the focus weekend takes place October 14-15, and final assignments are due November 10. If you would like to audit a course, the tuition is $100. If you would like to take the class for credit, the tuition is $180. The cost includes meals and overnight accommodations at Upton Hall on Friday and Saturday night (on a space-available basis). If you wish to take the class for credit, we encourage you to enroll by September 11. However, if you wish to audit the class, you may register at any time prior to the focus weekend. This course provides students an introduction to Anglican thought in historical context from the Reformation of the Sixteenth Century to the present. Students will meet the great minds of the English Church and consider their continuing relevance today. Avis, Paul. Anglicanism and the Churistian Church: Theological Resources in Historical Perspective, Revised and Expanded. T & T Clark: 2002. The Very Rev. Dr. Don H. Compier (Ph.D. in theology, Emory University) is Dean of the Bishop Kemper School for Ministry. He also serves as Canon Theologian of the Episcopal Diocese of Kansas and presides at the Spanish service at St. Paul’s in Kansas City, Kansas. 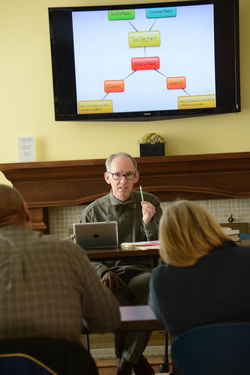 Previously, Compier taught Master’s and Ph.D. courses in theology, philosophy, and modern church history at the Church Divinity School of the Pacific and the Graduate Theological Union in Berkeley, CA. He has also offered classes at Saint Paul School of Theology and Eden Theological Seminary. He led the graduate program in religion at Graceland University from 2002 until 2014, developing an innovative online curriculum. He is currently conducting research on the history of Eucharistic thought in the Anglican tradition.